Forty-two years ago today (Sunday 7th October 2012) Britain’s affiliation with oil began. Oil was drawn from the North Sea in British waters for the first time, signalling the beginning of the 1970’s British oil boom. The event was billed as the potential discovery of one of the world’s major sources of oil and gas that could resolve the UK’s reliance on oil imports. The UK had seen her fellow North Sea neighbours The Netherlands and Norway exploit and benefit from the unique structures and hydrocarbon reserves at the start of the previous decade. Moreover, it had seen the wealth generated by the investment and technology needed to sustain extraction of oil. Seven multi million pound expeditions from British companies to the North Sea did not generate the quantities that were thought and expected to exist, particularly given the similar geology and success of Norway’s ventures. But a loan taken out by British Petroleum (BP) totalling £2bln; the largest loan that had ever been taken out in Britain at the time, struck gold; black gold. 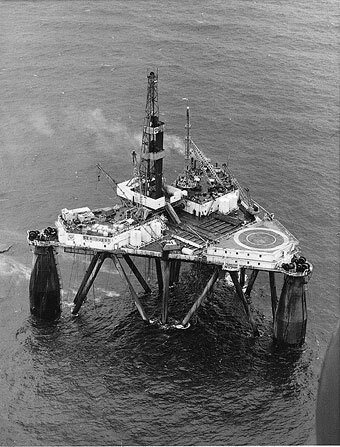 On October 7th 1970 BP’s flagship semi-submersible oil rig, the Sea Quest, drew oil 110 miles east-northeast of Aberdeen in what is now known as the Forties Oil Field. At the turn of that year Britain’s oil industry was thriving and within 12 months 41% of the UK’s oil reserves came from the North Sea. This reflected the shift in economic production as prior to 1970 almost all of Britain’s oil came from imported quantities across Europe and the Middle East. By 1980 five permanent oil platforms were located in the North Sea, beginning the drive to become self-sufficient. On the back of the 1970 breakthrough and immediate success of the industry, it grew stronger and stronger, reflected in record profits and a production peak in 1979 totalling 500,000 barrels a day, representing only 25% of the UK’s daily oil needs. However, regardless of the apparent success of oil extraction in its infancy, the UK oil industry did not avoid tragedy. 167 workers lost their lives on one of the world’s most successful oil platforms, Piper Alpha. The vessel was engulfed in flames after a flawed maintenance procedure resulted in an explosion in 1988. The industry had certainly experienced growing pains and widespread reforms and new safety procedures were put in place in response to the disaster. Despite these reforms the very nature of oil extraction, transportation and delivery makes it an industry with a great deal of risk and potential for environmental and ecological disaster. The Sea Empress catastrophe is perhaps the most recent high profile disaster case on British shores. The 1996 £60m disaster off of Pembrokeshire’s Milford Haven docks in the Cleddau Estuary provided the necessary incentive to review shipping requirement for large oil carrying vessels. 72,000 tonnes of oil escaped near the only coastal national park in Britain, at the time home to 35 sites of special scientific interest. In all 120 miles of Welsh coastline was contaminated, the consequences were widespread but brought under quick control. Britain had learned from the most difficult of lessons in oil safety and it can be concluded that the lessons learned have had far reaching effects beyond the British coastline. Britain today is the largest producer of oil in the European Union (EU) extracting approximately 20,000 barrels of crude oil a day, equivalent to US$2bn along 900 miles of seafloor pipes between 283 platforms; without doubt the scale today is beyond the expectations of the first workers aboard the Sea Quest rig. The sector employs 22,000 workers directly, that figures reaches the best part of 400,000 if you expand the industry to design and manufacturing, technicians and geophysicists to name a few. You would not be incorrect to speculate that the industry has been prosperous and successful despite notable disasters. But future energy demands, political pressure and the decline of extractable oil quantities will mean the industry faces a tough struggle both on UK shores and abroad in the near future. There is great pressure from both scientists and environmental groups to reduce the emissions of carbon worldwide. This inevitably requires the use of hydrocarbon sources as a means to provide energy to decline in the near future. Such is our reliance upon hydrocarbons and oil in particular that an immediate switch to a more sustainable and renewable energy production will not take place; instead the change is expected to be a long term process. Our investment into more sustainable energy sources must be one of the key matters to address within a decade if our fossil fuel usage is to decrease. It is not simply a case of replacing the finite resource, but to provide a reliable, renewable and sustainable energy supply to meet the demands of our ever expanding population.